Our kids’ stuff gets EVERYWHERE. What with arts and crafts, cookery bits, board games, play shopping, children’s books, bikes, scooters, etcetera, etcetera, we were finding that the kids’ things were spreading from their bedrooms to fill all the shared spaces in our home too. As a result, K-Dog and I found it more and more frustrating when WE wanted to do something; nothing was ever to hand or easy to get started on. But the good news is that when we took a hard look at our small-to-middling Victorian terrace house, even bursting at the seams with stuff as it is, we were able to find spaces to annex as dedicated ‘grown-up’ areas – one for each of us. All it took was thinking about what we both needed, and then identifying a few wasted areas around the house that we could make better use of with a little bit of reorganisation. And I promise you, if messy pack-rats like us can do it, you can too! Every home has a few nooks and crannies of wasted space. Make use of an unused fireplace to create useful storage! What am I going to use the space for? What key facilities do I need my space to have for this? Essential ones only! Where in my house can any of these key facilities be found already? What would need to be changed about those areas to give me as many of my key facilities as possible? How are those areas currently used? Would any activity/items need to be moved from those areas? How would it impact day-to-day life if one of those areas became my new space? We didn’t do this with any kind of formality, but thinking about these questions – and doing it in the order above – definitely helped focus us on what we needed, and what we didn’t; so if you’re struggling with where to start, give it a go. What I wanted was space to do the arts, crafts and sewing I’ve always loved. 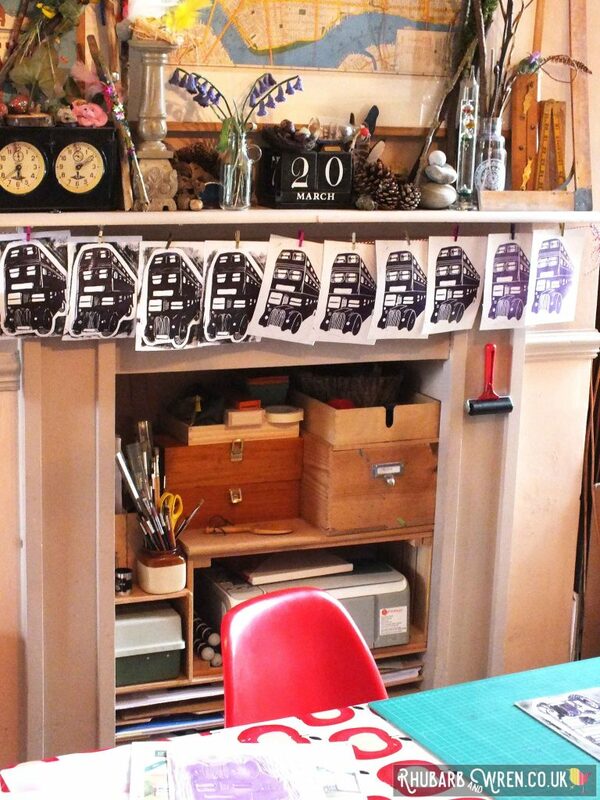 A dedicated art studio was, alas, out of reach for me, but I felt I’d be happy if I at least had a grown-up art cupboard (ie no glitter glue, pompoms or foam shapes…) and some table space for working. So when I thought about my absolute priorities, the key things I needed, it was quite simply that – a large-ish table, with storage for art materials and equipment close by. Our largest table is our dining table but as we have a breakfast table where we mostly eat, the dining table ends up a bit of a dumping place for random stuff. It would make no difference to our day-to-day lives for me to use it as my art making space, and it could still be used for the occasional extended family/friends meal with a quick tidy. Did I mention it was basically a dumping zone anyway? Having to tidy it before use was pretty much par for the course! This table is in our front room – a long space knocked through from two rooms. There is a chimney in both halves, and while the sitting room end has a lovely Victorian-style fireplace, the one behind the dining room table is just a bare cavity with a wooden mantle surround. It was definitely under used, since all it held was a pile of glitter ball baubles I’d had since University (yes, they were rather dusty). Rehousing them to the local charity shop left a lovely empty space, just begging to be filled. But not with the kids’ stuff. Nope, with mine. I kept it simple, partly to get it done quickly, but mostly because that’s all it needed. I originally planned to put up proper shelves inside the space, but found that the old wine boxes I store my art stuff in actually stacked together rather nicely – no drilling, nails or screws required. 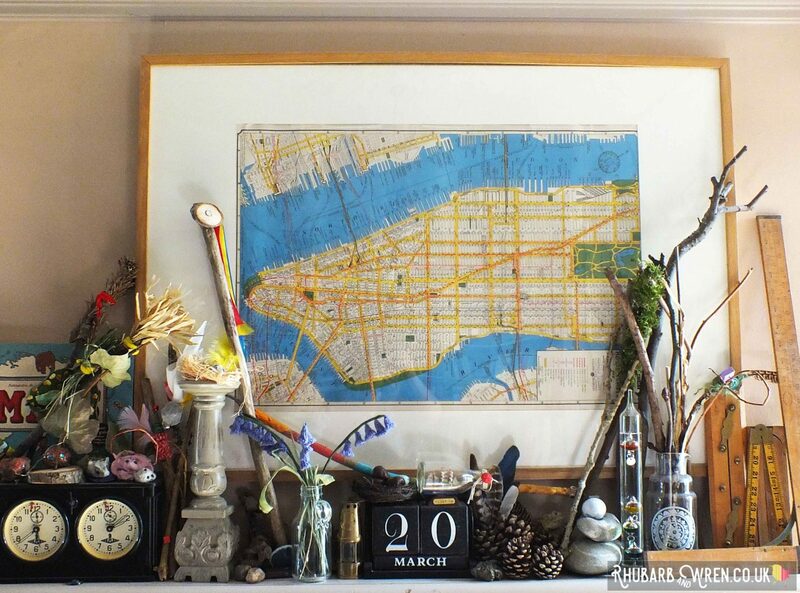 Go bohemian and put your art supplies on display! For doing art work, it helps to have lovely light from nearby windows! 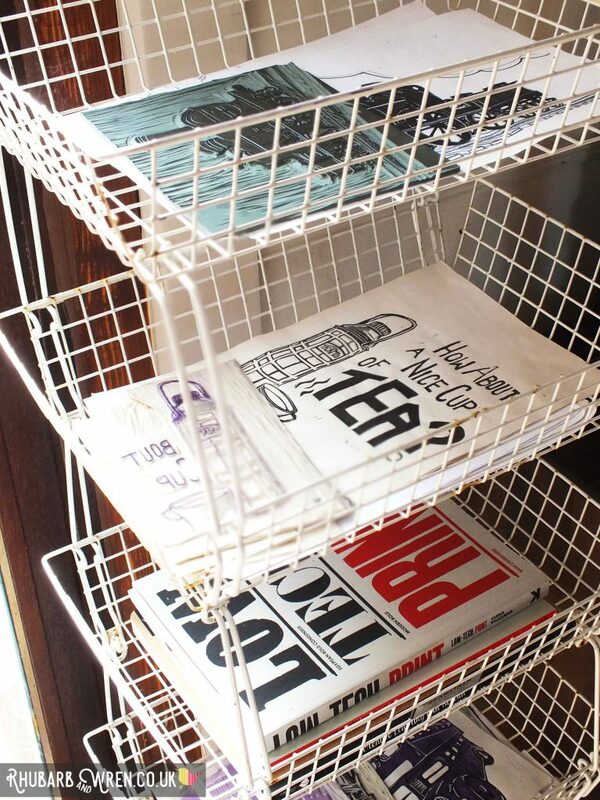 The only new bits I bought were a pair of MDF paper racks – one for A3 and one for A4. Placed next to each other, they were exactly the right size to fill the width of the fireplace and made an excellent, extremely useful, bottom shelf. I then stacked the wine boxes and an old wooden crate on top, making a nook for my printer that supported a shelf for the rest of my supplies. 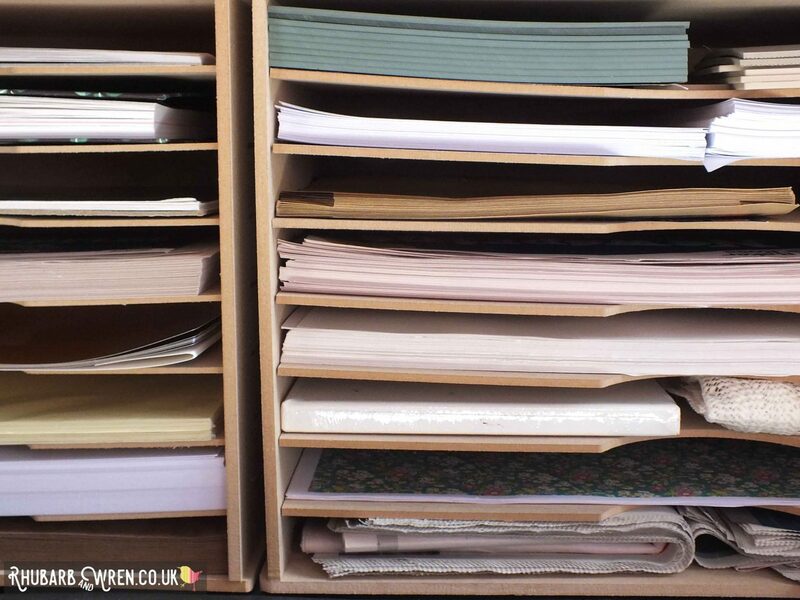 MDF paper racks are relatively inexpensive but make storing essential supplies a piece of cake! A nail in the fireplace wood surround makes an instant hook for ink rollers. 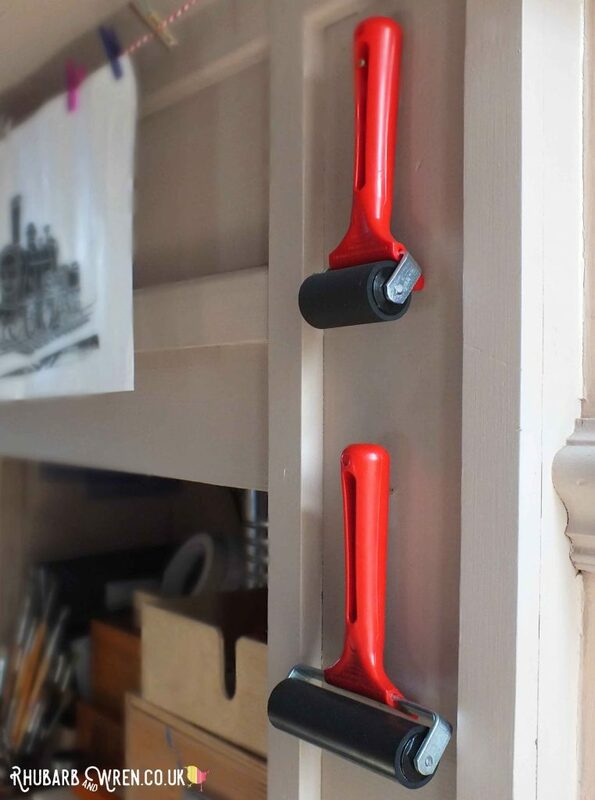 I also included a couple of Ikea A4 plywood magazine files, for some vertical storage, and put a few nails in the surround so that I could hang my ink rollers – finally stored the way they should be! Old wine boxes make great storage for art supplies! Finally, there were already a couple of cup hooks screwed into the underside of the mantlepiece (I use them at Christmas to hang up garlands). Attaching a length of twine and some miniature pegs made a great drying rail for my prints, and again took only minutes to do. 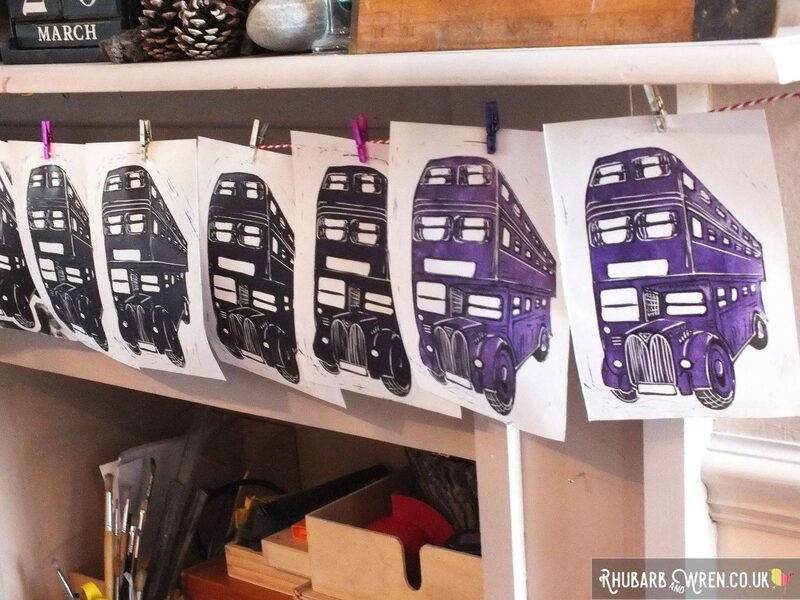 Hanging prints out to dry on a simple line attached to the mantlepiece. My three and seven year old kids were very interested in the new set-up, but have also been very respectful – even little T-Bird understands that this is ‘my’ stuff, and that they have their own art equipment elsewhere that she can use whenever she likes. 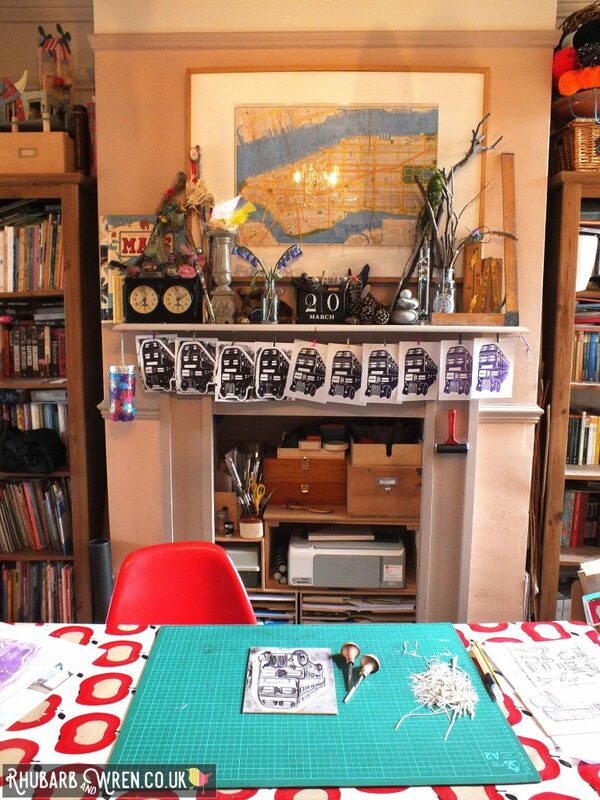 They know they can have a go with my things when I’m working at the table (T-Bird especially loves inking up a lino with a brayer and taking a print) or they will bring along their own stuff to do alongside me. Otherwise though, they have so far been happy to leave the boxes alone. This was a concern for me beforehand as my linocutting tools are very sharp, so I took especial care to show them both everything and explaining why they could not touch some things without me. 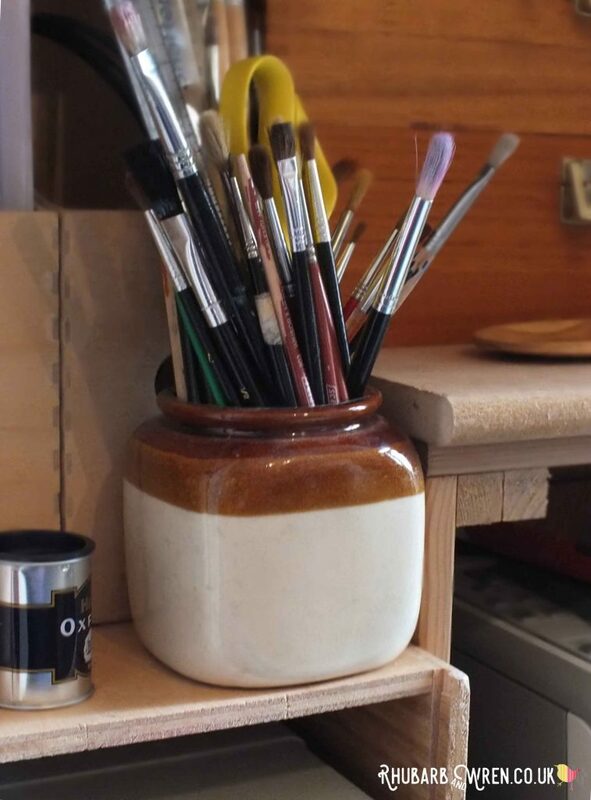 No studio is complete without a jar of brushes! 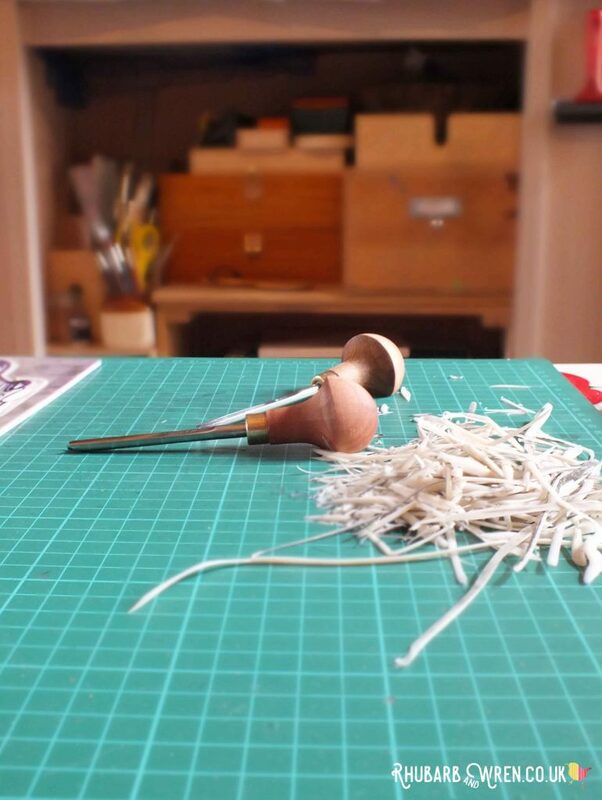 My extra sharp Pfiel lino cutters. 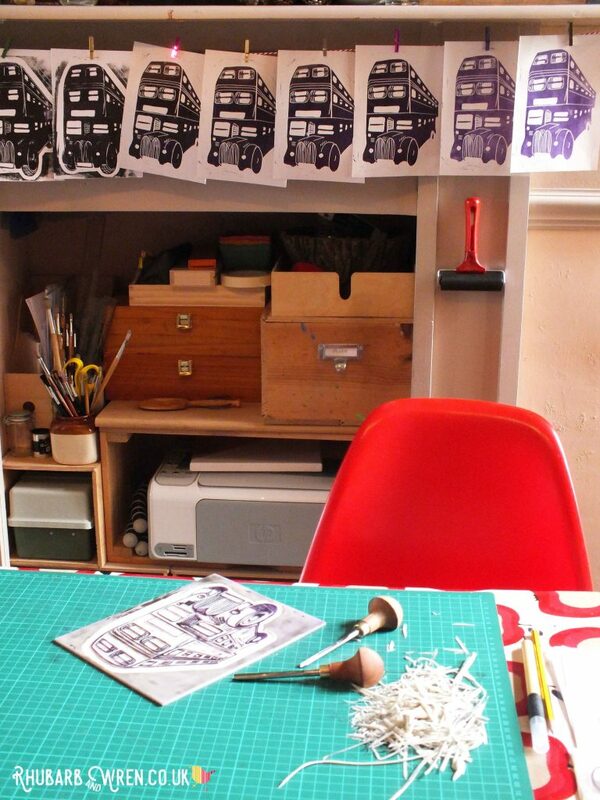 The last thing I added to my new studio space was an old industrial-style paper rack that I’d got for a bargin on ebay – the owner had been using it for seed trays in his greenhouse, so it was a little unloved! It fits perfectly into a corner just to the side of the table, and is just right for storing finished prints and pieces, and as a drying rack for work in progress. My bargainous Hago Beanstalk stacking trays – eternally useful! I could also have utilised the mantlepiece over the alcove as an extra shelf, but it’s very narrow and was already in use as a mini nature shelf for the kids’ finds and their forest school makes. I love having these bits out on display for them so decided to leave that as it was. I did give it a dust though… it had been a while! 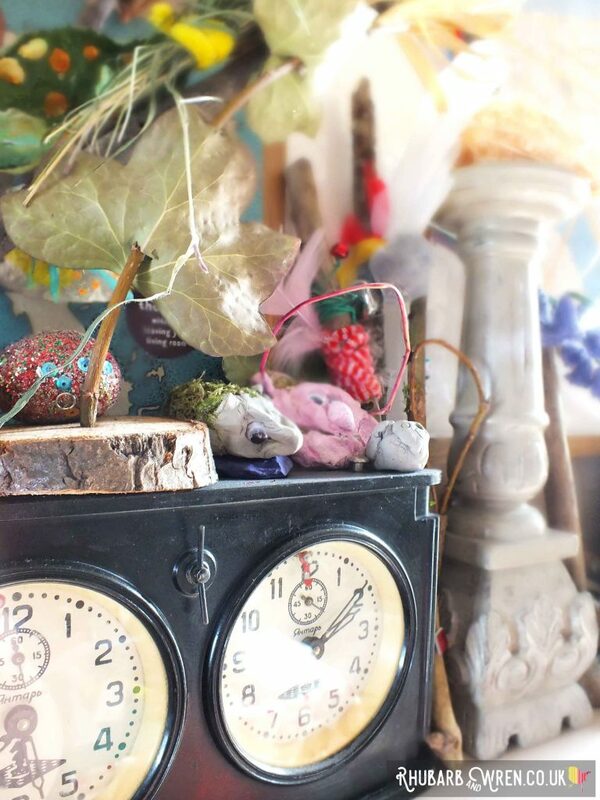 We use our dining room mantlepiece as a shelf to display the kids’ nature ‘finds’ and their forest school crafting. It took me no time at all to set this up, and yet it has made a huge difference to my enthusiasm for creating again. It’s now so much easier to get going, and everything is exactly where I need it. Us grown-ups had ended up with less space for our own bits than we had when living in a flat literally half the size of our current abode. For the most part, we were fine with this – we never wanted a home where the presence of children was undetectable once they were in bed – but now we’ve clawed something back for us, even just this little bit of space, it has helped us regain our sense of identity and I hope provides a positive role model for the kids. 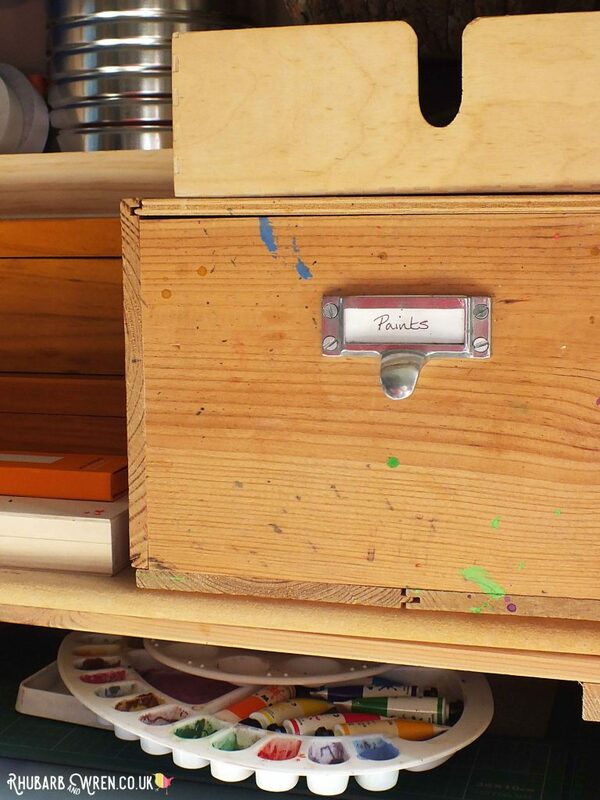 Looking to create some art storage for yourself? The easiest and cheapest approach is to look around at what you already have. But if you are not a pack rat like me, then these are similar products to some of the things I used. All links are affiliate links, which means that if you click through and buy anything, I will receive a small amount towards the running of this site, without adding anything to the price you pay. Thank you so much for your support! 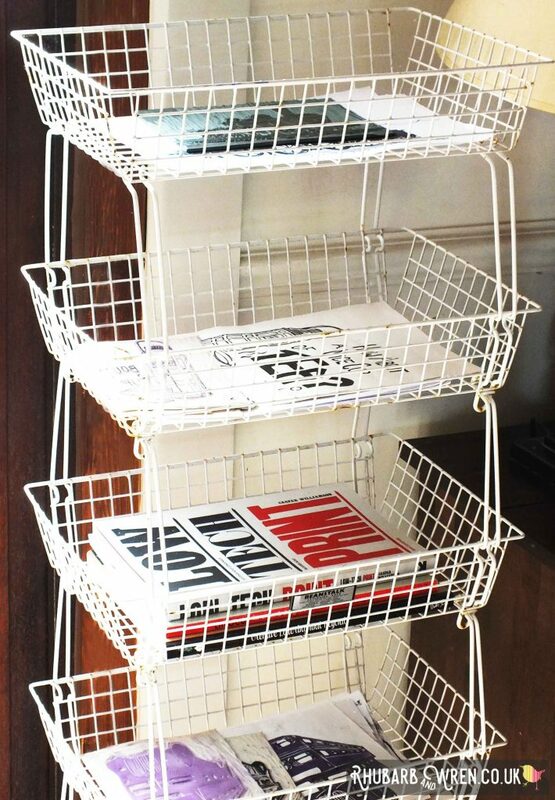 These storage solutions are similar to the paper storage racks I used. And if, like me, you’re squeezing storage into a small space, go for things that stack – like these crates and art drawers. If you’ve enjoyed this post, why not take a look at some of these others? Vintage Hago Beanstalk stacking trays – great industrial-style storage! Vintage bits like my old Soviet chess clock share space with the kids’ forest school crafts and nature finds.